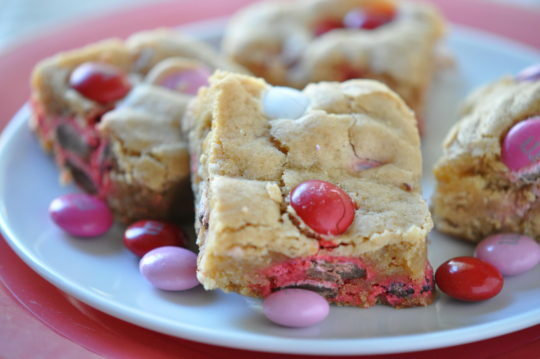 This is our go-to holiday bar cookie for Valentine’s Day or any holiday by using holiday themed chocolate coated candies. Enjoy more recipes from Holly Clegg’s cookbook, trim&TERRIFIC Kitchen 101: Secrets to Cooking Confidence. Preheat oven to 350°F. Coat a 13x9x2 inch baking pan with nonstick cooking spray. In a large bowl, combine butter and brown sugar. Add eggs one at a time, beating well. Add vanilla. In bowl, combine flour, baking powder and baking soda. Gradually stir into sugar mixture alternately with milk. Stir in chocolate candies. Transfer to pan. Bake 18-20 minutes or until toothpick inserted in center comes out clean. Don’t overcook. Terrific Tip: You don’t need a mixer for this recipe as you can stir everything easily in a bowl. You can use semisweet or butterscotch chips year-round.